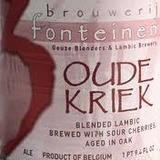 Oude Kriek 3 Fonteinen is produced by ripening of cherries (both the flesh and the seeds) in young Lambic. This process takes between 6 to 8 months. After bottling the beer matures for at least 4 months in a warm room where the spontaneous fermentation in the bottle is done. The head of Oude Kriek is very sensitive to the concentration of the cherry seeds containing oil and may differ from one year to the other.